What is a 7:3? The definition given most often is a rod in which the 7 bottom parts are stiffer and the three tip parts bend more easily. Even aside from the fact that most tenkara rods don't have 10 parts, you still have a system that is of little use to tenkara rod buyers. The reason it is of little use is that there is no consistency. Not only is there no agreement between manufacturers on what a 7:3 rod is, even within one company, two very different rods can be labeled 7:3. Among Daiwa rods, the NEO Tenkara LT rods are labeled 7:3, as are the Enshou Tenkara LT rods and the Kiyose 43MF Keiryu rods. The three are very different from each other. Unfortunately, my apartment is now full of rod boxes and I no longer have an empty wall against which to take new photos. To compare rods, I'm afraid you'll have to look across two different photos. 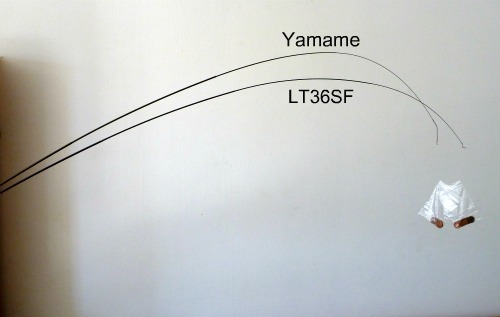 With the Yamame for reference (also rated a 7:3 by the way), compare the bends of the Kiyose 43MF and the LT36SF. Both are rated 7:3 but they are not at all the same. 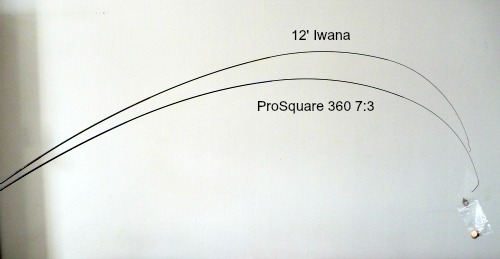 For the next comparison, between the Daiwa LT36SF and the Nissin Pro Square 360 7:3, please use the Iwana as a reference. If the Pro Square and LT36SF bends look like they can't both be 7:3, compare the Pro Square in the photo above to the Yamame in the top photo. How can they both be 7:3 rods? 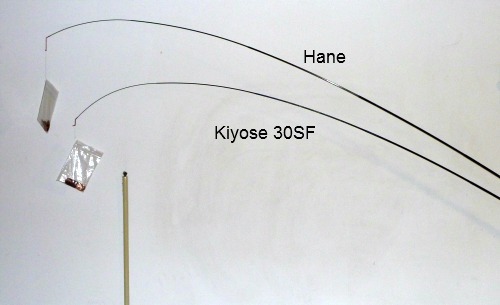 Now, compare the Hane to the Pro Square. Both are described by their manufacturers as 7:3 rods. I can only conclude that the 7:3 label is so inconsistently applied that it is of no value to rod buyers. If someone has one 7:3 rod and confidently buys another 7:3 rod because he likes a 7:3 action, he is in for a rude shock. I understand Tenkara USA is planning on changing their rating system for rods. I think that is a very positive step. If I could throw in my 2 cents, I would urge that whatever system they come up with be 100% objective and easily measureable. For a prospective customer to know what a Tenkara USA rod would be like compared to the rod(s) he now has, he would have to be able to measure his own rods using their system to see how they compare. If the system is not precise (where does "mid flex" end and "tip flex" begin?) or objective (how fast is "fast") that would not be possible. Further, I would suggest that the 5:5, 6:4, 7:3 ratings be no part of it. Since Daiwa and Nissin are likely to keep their existing systems, conflicting 7:3 ratings will still exist. Adding another, different, 7:3 rating is not going to help. If all 7:3s are different, what is a 7:3? 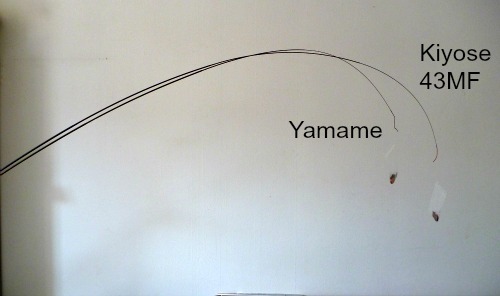 Whatever system Tenkara USA adopts, I believe there should be a method of measuring and rating rods that the average Joe can do on his own in his basement or back yard. For Joe's measurements to be of any use to Jim, they have to be completely objective. Jim would have to know that he would have gotten the same ratings had he measured Joe's rods himself. If he can't rely on Joe's rating to be the same as his, the only way for him to know what a new rod would be like is to buy the rod and measure it himself. The whole point of a rating system is so he doesn't have to buy a rod just to see what it's like. I am not by any means saying the Common Cents System is what they should use or is something that cannot be improved upon. I chose it for my own use to compare rods, with no intention of ever publishing it. When the topic came up on one of the forums, I decided to share my research in an attempt to move the discussion forward. Not at all surprisingly, the people who were most adamantly against the Common Cents System, deriding it as little bags of pennies, have not proposed an alternate. The only person who has suggested an alternate system uses Common Cents as the basis for his ratings, merely adjusting it for length. I have said before and will say again that it doesn't tell you everything, but it does tell you a lot more than you knew before and to this day is the only method that has been proposed that allows you to compare rods from different manufacturers in a consistent manner. I recently got an email from a guy who wanted a line recommendation for a 6:3 rod. I told him they don't exist, it had to be either 6:4 or 7:3. He sent me a link to the shop where he'd bought it. Sure enough, it was a 6:3, described in black and white as being a 9 part rod and having the lower 6 parts stiffer and the upper 3 parts softer. The common system of rod rating is broken.